In negotiations on new Reform Kotel prayer space Women of Wall promised AG not to smuggle in Torah scrolls - today they were at it again. 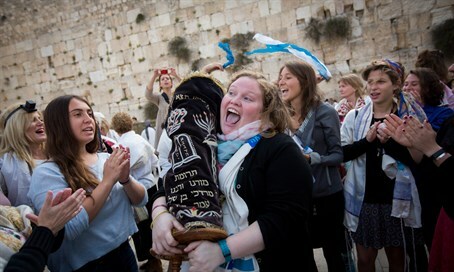 The Women of the Wall (WoW) group held a Rosh Hodesh prayer session at the Western Wall (Kotel) on Friday morning, and once again smuggled a Torah scroll into the women's section of the Kotel Plaza in breach of their agreements with Attorney General Avichai Mandelblit. During the negotiations over the establishment of a second Reform prayer space at the Kotel, which was approved by the government but faces stiff opposition, it was agreed between WoW and Mandelblit that the Reform group would stop smuggling in Torah scrolls and causing provocations in the Kotel Plaza. Kotel Chief Rabbi Shmuel Rabinowitz said in response to the latest Torah smuggling that "this act once again testifies that the goal is only provocation and defiance, strife and quarrel and a desecration of the holy, and no gesture or appeasement proposed to them will help against this intention." Rabbi Rabinowitz called on Religious Affairs Minister David Azulai (Shas) to change the regulations on the preservation of holy sites and determine that prayer at the Kotel will only be conducted according to the instructions of the Chief Rabbinate, without connection to the government plan for a new Reform prayer space and recognition of the Reform movement. Back in July 2013 WoW head Anat Hoffman wrote an article on the Religious Action Center for Reform Judaism website entitled "support our rally to end the chief rabbinate," in which she called "to throw out the whole rabbinate." While the Reform movement has obtained several political victories in recent weeks, a Pew poll this week found the movement is not gaining traction in Israel. The decision on the new prayer space, which comes in addition to the Ezrat Yisrael section established in 2013 by the government, has raised concerns as it removes an area in the southern part of the Kotel from the authority of the rabbinate, transferring it to the control of the Prime Minister's Office. Such a move is a breach of the status quo, by which the rabbinate maintains authority over holy sites.